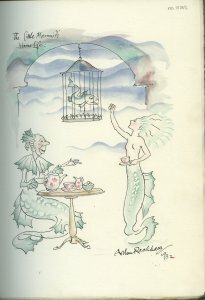 Description	 Hans Christian Andersen: The Little Mermaid's home life; original drawing by Arthur Rackham, showing her home life under water, feeding a fish within a birdcage while her grandmother serves tea MS in English on paper, London, 1932, 1 f., 27x18 cm, 2 lines in cursive script, 1 aquarel autograph, signed. Binding	 London 1932, full green morocco gilt, sewn on 5 cords by Sagorski & Sutcliffe. Context	 Within the limited edition of Fairy Tales by H.C. Andersen, illustrated by Arthur Rackham, London, George C. Harrap & Co., 1932. With the following note signed by George G. Harrap: This edition which contain an original drawing by the artist is limited to 9 copies of which 8 are for sale. The present copy is no. 8 and signed by Arthur Rackham. MS 2528/1 is the poem, Little William, autograph by H.C. Andersen. Provenance	 1. Keith Fletcher, London, June 2011. Commentary	 Hans Christian Andersen (1805-1875) Danish author, famous especially of his fairy tales. He published over 150 fairytales from 1835-1858, besides poems, plays, travel books and novels. The Little Mermaid was written as a ballet in 1836, and published the year after in: Fairy Tales Told for Children, 1st collection, 3rd booklet. The story is about the little mermaid living with her grandmother, her father the Sea King, and five elder sisters. She wants to give up her life and identity as mermaid to obtain a human soul and the love of a handsome human prince she saved from drowning.